Home for the Harvest participates in affiliate advertising programs. Please visit the Affiliate Disclosure. Once you’ve selected the crops for your garden and decided on the layout, it’s time to create a garden planting calendar! Keeping your seed starting, transplanting, and harvesting activities organized will make a huge difference in growing a successful garden. Once you’ve scheduled out your garden crops into an easy planting calendar, you’ll be ready to get those veggies in the ground! Having an abundant garden means that you’re able to grow the right amount of healthy crops with a reasonable amount of time and effort. If you’ve already selected your garden crops, you’ll have noticed that each plant has different preferences. Some plants like to be grown indoors for the first few weeks of their lives, while others will do well when planted directly in the ground. Some can survive chilly weather, while others will suffer when temperatures drop. 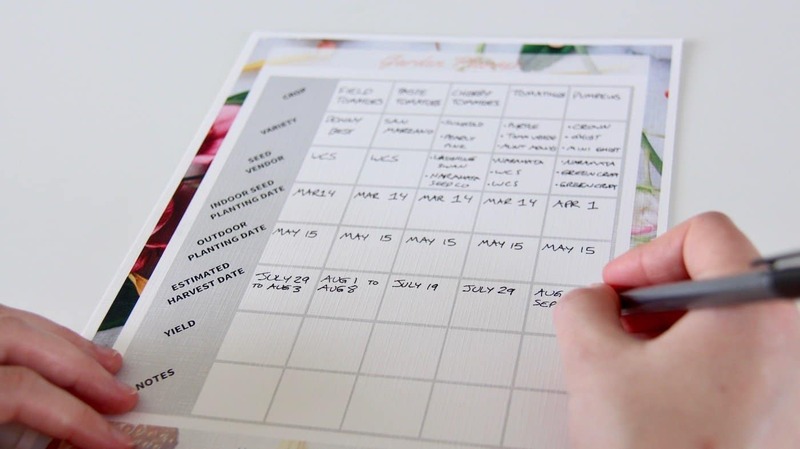 You need to go through the process of creating a planting calendar before you start your garden to ensure each crop gets the correct treatment. Once you’ve selected your crops, it’s time to schedule them out for the year into a planting calendar. Seed planting dates are generally referenced to the last spring frost date for your area. You will have recorded this date earlier in your free garden planner while completing the growing zone step. 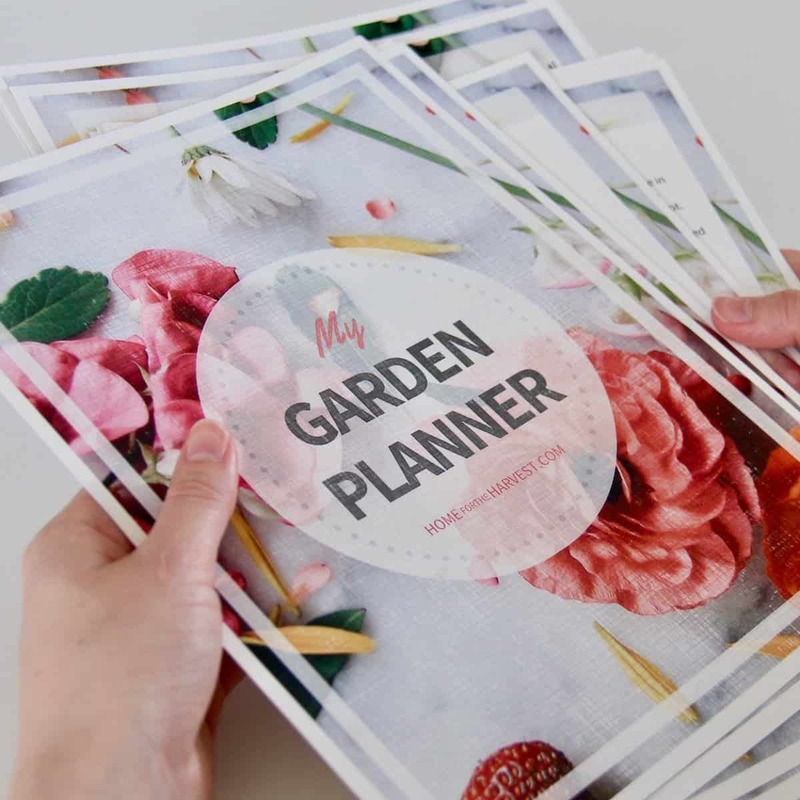 (If you don’t yet have your free garden planner, you can grab a copy and read about the previous steps in the garden planning process here). The first step is to sort through your seeds, either using the catalog/website or the packets themselves. Lay the packets out on a flat surface and put them in order of the date that the seeds are to be first planted. Some seeds will be planted indoors (indoor seed starting), while others can be planted directly into your garden soil outside (direct-seeding). Use the first date that the seeds will be taken out of their packet (either indoors or outdoors) when putting them in order. If you don’t have your seed packets yet, or if this info isn’t easily available from the vendor, you can use an online calculator instead. This outdoor planting calculator will give you outdoor planting dates for many common crops based on your last frost date. Simply count backwards to get the indoor planting date if the crop is to be started indoors. Enter your info in this form to subscribe and download the free Garden Planner! Once your seeds are written down in order of which to plant first, you’ll need to schedule actual dates. Seeds from local companies may give you a specific month or planting date, but most packets will just provide guidance on how many weeks before/after the last frost date in your area. Once you have the estimate of your last frost date, count backwards/forwards to find out when to plant each seed. You can manually calculate the planting date for each seed yourself, or use an online calculator. 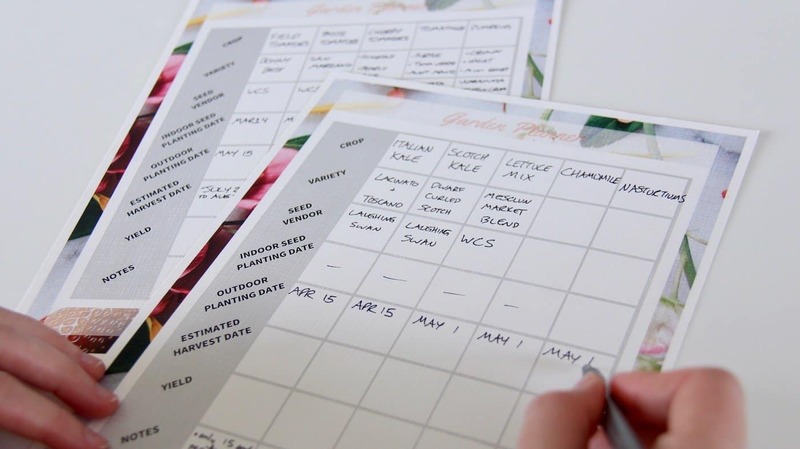 Fill out the planting date rows of your garden planner for each crop. If the seeds for a certain crop need to be started indoors, you’ll have two planting dates (indoors and outdoors). Seeds that will go directly into the garden (called direct-seeding) will only have one date (the outdoor planting date). If you’re growing a lot of crops, you may wish to group some of the dates together so that you’re not having to start new seeds every day of the week. I like to group mine together in frequencies no greater than once per week. Remember that it’s generally better to start seeds slightly later than to start them too early. Most gardeners “rush the season” when creating their planting calendar, after waiting all winter to get gardening again. If you can’t wait and really must start some seeds, try growing some microgreens to hold you over. If you’re curious to know when others are starting their seeds, come join the Organic Gardening Community Facebook Group. It’s a great free place to connect with other gardeners, ask questions, and share how your garden is doing! Some gardeners also choose to group their dates by external factors. In my area, for instance, many gardeners love to plant their whole garden outdoors on May Long Weekend. It’s a bit of a tradition. They will do all of their direct seeding during that weekend, and back-calculate all their indoor crops so they’re ready for transplanting outside on May Long Weekend. This works well for people who want to do it all in one go. Still others like to embrace spiritual factors when creating a planting calendar. Biodynamic gardening, for instance, includes gardening by the moon’s cycle and zodiac symbols. Planting and harvesting dates are scheduled in accordance with the lunar calendar (waxing or waning moon, et cetera), as well as the type of symbol (earth, water, air, fire). Once you’ve finished your garden map and created a schedule for planting your crops, you’ve finished the garden planning process! Your planner should now be full of all the info you’ll need in the spring. You’re now ready to get out into the garden with confidence! 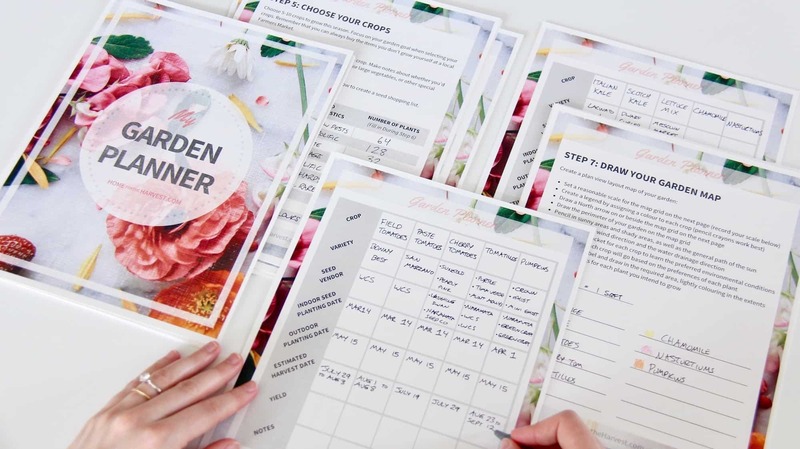 If you don’t yet have your free printable garden planner, now is the time to get your copy. Start at the beginning, and plan out a wonderful garden for the year! 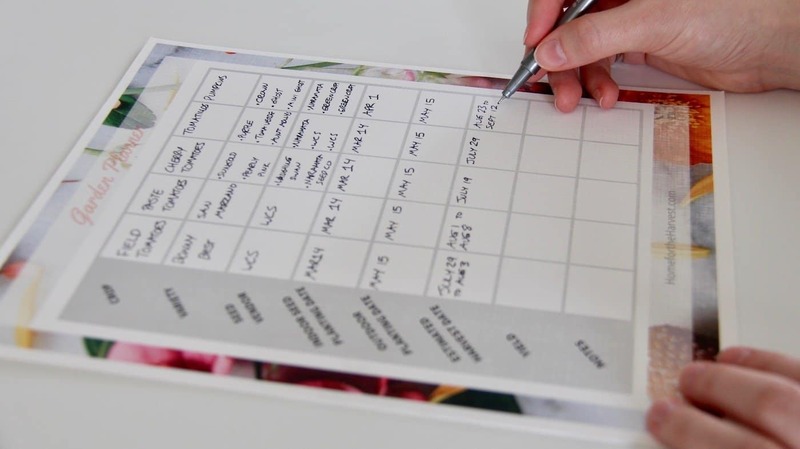 The planner includes a special table to help you schedule your garden, a page for mapping, as well as the other sections required for planning a successful garden. More info about the planner and the companion garden planning articles can be found on this page. Did you enjoy the garden planning process? When are you starting your first seeds this year? What are you most excited about growing!? Share your comments, stories, and questions in the comments section below! Just ran across your website after receiving all my heirloom seeds in the mail today! Thank you for such a complete (and awesomely free) resource to make it easier for me to figure out how to create a garden with my kids this year. Many blessings!